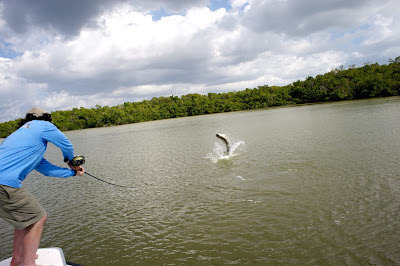 After several months of phone call conversations and planning, I was very fortunate to spend the last four days fishing with my good friend and former Head Guide Andy Lee of Grassroots Guides, Beneath the Mangroves. Andy recently relocated to Chokoloskee, Florida, where he has been fishing the Everglades backcountry for redfish, snook, and most recently, tarpon. We had quite a trip. Andy runs a 18' Hell's Bay and it's the perfect rig for fishing the backcountry flats, weaving through the creeks and poling across the big bays of the Everglades. 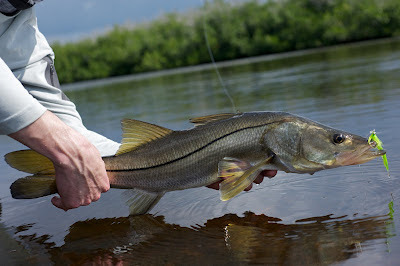 We spend the first three days sight fishing to reds and snook. 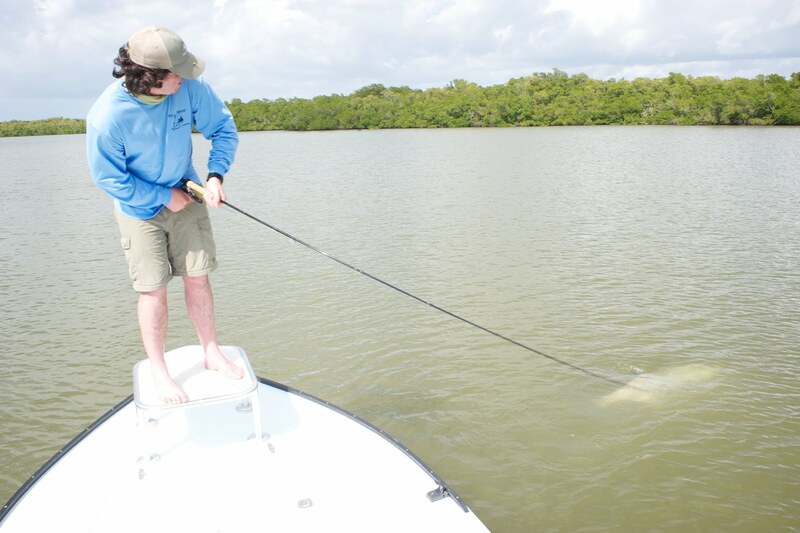 The redfish were a little easier to see: more out in the open, along vegetated flats or among oyster beds. The snook were trickier business, as we poled countless banks trying to spot these fish lying in ambush beneath the mangroves. 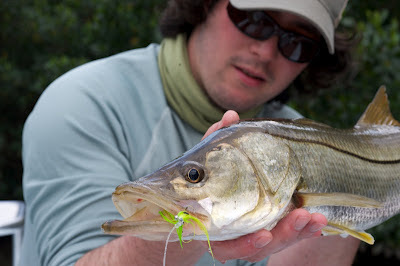 We had a good number of shots for snook, but they are a wiley fish. Many times we would see one and before we could drop a cast in front of it, the fish had retreated to cover beneath the trees. We would often pole by a fishy looking spot, unable to see a fish only to see the fish bolt from underneath us or the trees to explode as the fish took off. 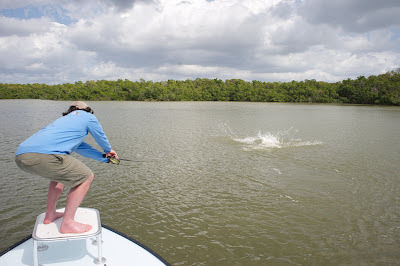 When we did see one and get a good cast in front of it, the fish would either immediately bolt or destroy the fly. We had some great takes and were able to land a few. 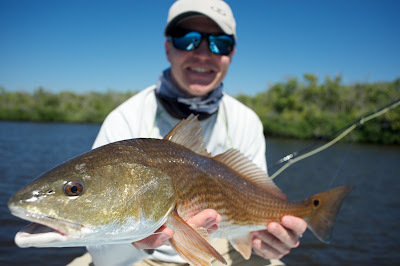 We also found a good number of redfish. A little easier to see, but often just as fickle, we brought a few of these to the boat as well. Enticing the reds to strike was a little more sensitive as we teased them to strike by pulling flies away and then letting them catch up. A great game to play. At some point during our third second or third day we started seeing some black drum cruising amongst the reds. A fast sinking crab pattern was the trick for these odd looking fellars. We had a slightly nervous moment as we noticed a gator approaching while Paul landed one particular drum. 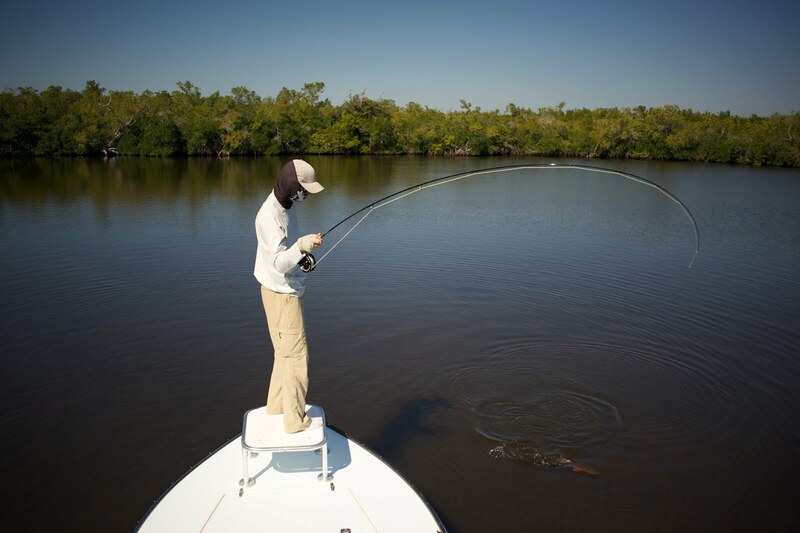 Andy made us second guess ourselves when he joked that gators always travel in pairs, one under the surface. 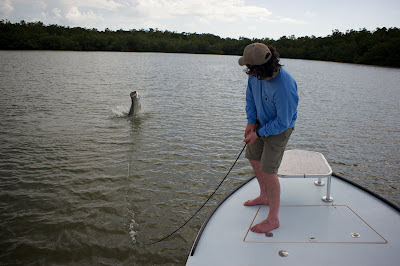 For our last day on the water, we fished for reds in the morning and then decided it was time to try and see some tarpon. We were surprised and instantly excited as we poled down our first bay and a heron spooked one and then we started seeing tails and wakes. I was first up and had a good shot at a happy fish about a foot under the surface. I made two casts and on the second had an eat, but it didn't stick. We were pumped though as our first good shot resulted in a take. On we went. Paul took some shots at some fish to no avail and then it was my turn on the bow again. 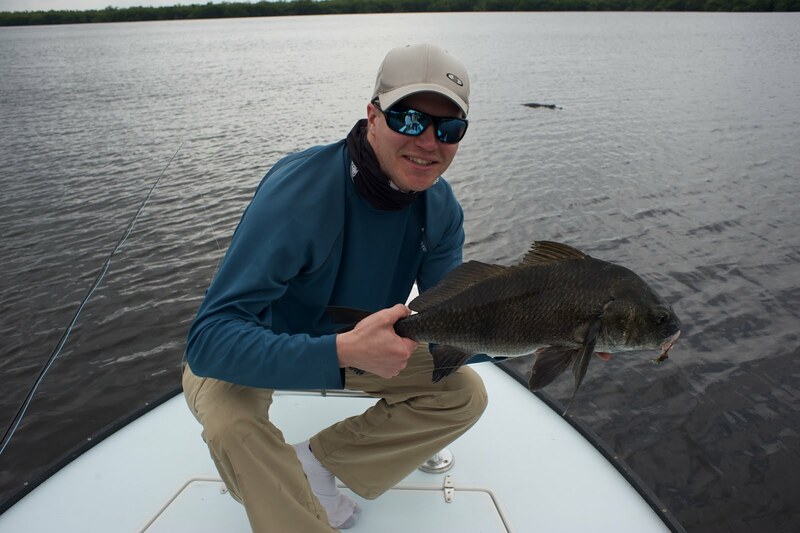 The fish were hard to see given the muddy, murky water of the everglades but we soon found ourselves right upon a very large shadow under the surface. 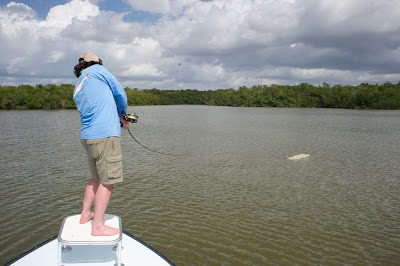 Wind at the moment almost blew us over the fish, but Andy circled us around to where I could take some good shots. My first four casts were no good, but on the last, it looked as though the fish was interested. I was lucky the fish hadn't bolted. 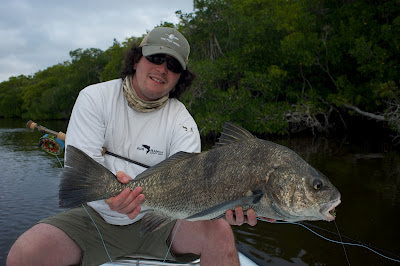 I took another cast and this one was on the money, a few inches in front of the fish. Not even six inches into my retrive and the water exploded, the fish coming out of the water to crush the fly, a tan, deer-hair head slider. And then it was on. Into the backing within seconds, leaping in the distance, the line cleared and I remained tight. It was looking good. I had some good shots at tarpon last spring but wasn't able to coax any to eat. We joked later that this fish chose me, allowing for my first nervous casts to pass until I put the fly where he wanted it. The fight lasted about 40 minutes, the last 30 or so within 30 feet of the boat, the hardest part of the whole ordeal. Finally the fish rolled over and with a hand on its lip, the fish boatside, Andy grabbed the leader and it gave. Away the fish went. High fives and laughs filled the boat as we recounted the battle and charted the boat's course as the leviathan towed us around the bay. It would be our last fish of the day and of the trip, a perfect way to go out. It didn't take long before we started scheming our return. An easy, two and a half hour drive from Miami International Airport, I recommend anyone looking to get into some Everglades tarpon action get in touch with Andy, and hang on for the ride. Hell ya Robbins. Some great pics. Looks like Ando is gettin dialed. Silver king on the fly. That is a dream come true good sir. Well done indeed. Hell yes!!! As the kiwi's say, "Good on ya mate!!"